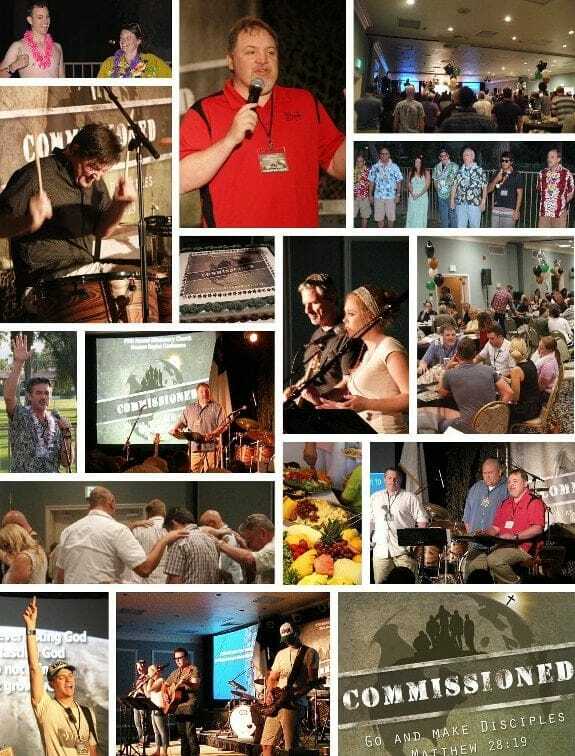 The 95th Annual Missionary Church Western Region Conference was held May 20-22, 2014 at the Indian Wells Resort in the Palm Springs area with our conference theme COMMISSIONED…Go and Make Disciples! Watch our Conference Preview…Calling ALL RECRUITS! Featured speaker was Jim Putman, Author, Pastor and co-planter of Real Life Ministries in Post Falls Idaho. Jim reaches the nation through speaking conferences, the web, radio and weekend services. He is the author of numerous books in the area of Discipleship through small groups. Be sure to listen to all 5 sessions (MP3 audio) of Jim Putman’s message, along with additional insights from Real Life Ministries Team Leader’s Keith Strasburger and Eddie Bateman on our website at 2014 Regional Conference Audio Sessions. COMMISSIONED Field Manual: Download the manual distributed at conference along with the PDF table exercise and “Discipleship Wheel” with questions that you worked on as a team. The original size was a 36” x 36” wheel but the PDF has been scaled to fit a letter size printout which you may want to enlarge. Rounding out the conference presenters were Jim Firth, Senior Pastor at Hope Community Church and Worship Leader of the newly formed Suite 227 Commissioned Band. The band featured: Lead Vocals & Guitar- MacKenzie Bowsmith, Vocals & Guitar- Jeff Foss (Worship Leader of The Journey Church, Camarillo), Electric Guitar- Gabe Hollis (Hope Community Church), Odell Barnett – Keyboards, Percussion-Ory Brochet (Pres/CEO The Orybon Company), and Bass Guitar & Vocals- Jim Firth. This year’s worship team brought a new dynamic style of worship and inspiration for the first time ever playing together! These talented musicians and Jesus freaks brought down the house and inspired each of us to worship and express our praise before our wonderful creator! Thank you to our coffee & dessert sponsor: Joni & Friends Int’l Disability Center and Bethel College for helping with the Kindle Fire giveaway. Toby Lazo, Western Region Hispanic Ministries Director led a special session for our district Hispanic pastors. This year the conference was also translated simultaneously into Spanish for our Hispanic Pastors and Churches. CFW Legacy Breakfast, Almost 100 participants attended Christian Foundation of the West’s Breakfast to hear Board Chairman Randall Sanada and President Kathy Saigeon present compelling stories about significant acts of generosity from families within the MCWR. Stewardship Pastor Rick Fuselier gave testimony about how CFW has helped to expand Family Stewardship at Calvary Community Church, Westlake Village CA. Their message was clear- when families engage as stewards of God’s resources 24/7 with support and encouragement from the church those families seek out ways to be more generous and intentional supporters of Kingdom Building efforts. Every family can make a difference in the Legacy they Leave! Church Multiplication Director, Dave DeVries reported on the most recent church plants and Missional Movements being started. John Williams and Elias Recinos shared insights of their church plants. Steve Bagdanov shared a tool their church is using for Discipleship outreach while The Barn shared their unique perspective on making Disciples thru developing personal relationships. Also on the theme of Discipleship was a very creative “cookies” video produced by Sojourn Church in Oxnard. Commissioned Business: RD Mike Livingston led our business meeting on Wednesday morning. His report included sharing from new MC President Steve Jones. Newly credentialed Pastors and new Pastors to the Region were introduced. A special thank you and placque was presented to Jim Bruno for 11 years of faithful service as the Regions treasurer by Mike Livingston. Prayer Warrior, Pastor Ben Jennings blessed our conference during the Morning Prayer Chapel as well as several times throughout each of the sessions. Many expressed thanks for his deep spiritual insights. Poolside Banquet & Aloha Luau…Capt. Fun (aka Dave DeVries) led our fun and festive poolside luau with authentic music, fellowship and non-competitive table games. Awards for the Most Festive Hawaiian Attire went to Living Oaks elder Jim Sawyer, while the Most Unattractive Shirt was awarded to The Barn’s Jaime Mitchell after numerous applause and crowd support! Newly licensed Kris Richards showed his outstanding skills as winner of “the Heads Up” game. Congratulations to all of our winners! Congratulations to Maggie Cosio, Community Bible Church-Ventura —Grand Prize Winner of a new IPAD, Roy Shinn, The Promise Church, Riverside – Winner of a Kindle Fire and Kris Richards, Windsor Community Church, Colorado — Poolside Banquet Winner of a Weekend Getaway in a guest suite at the Indian Wells Resort Hotel! Happy Video…thank you to Lynn Klamser for capturing candid shots during our conference and poolside dinner banquet featuring our very photogenic attendees! Special thanks…We would also like to compliment and give recognition for the exceptional talents and many man-hours of our Tech Team: Jim Firth (Tech Director), Jeff Foss (Audio/Visual Specialist) Gabe Hollis (Videographer), Jonathan Mitchell (Tech Support) and Canaan Yee (Tech Support). Thank you to Shelly D. Yee (Region/Conference Event Planner) and Mary Ellen Dolbier (Regional Office Administrator) for the countless hours of conference support and prep! Kudos to the entire SPT/Conference Team: Dave DeVries, Julio Diaz, Jim Firth, Dan Flores, Linda Hoover and Shelly Yee who are already planning next year’s conference, May 19-21, 2015!